VIENNA, Austria -- He is the beloved composer who has won plaudits worldwide for the way he has overcome his disabilities. Now, however, it has emerged that Ludwig van Beethoven has, in fact, been lying to us all. 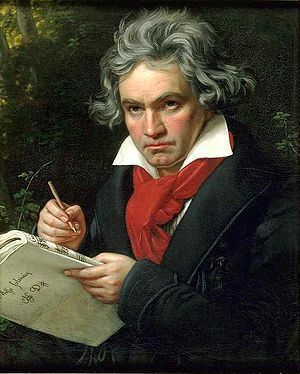 At a dinner party planned by his live-in girlfriend and attended, for the most part, by her friends, Beethoven admitted to the one friend he was allowed to invite that he "...hears just fine, thank you very much." "Feigning a state of deafness is the only way I can get time to myself to make music." he said, between sips of brandy from his favorite pewter mug, "Before, it was all 'Blah, blah, blah. Wiggy, you need to listen to me. Blah, blah, blah'. I'd just get through the 'Dah-dah-dah dum' and she'd come clomping into the room to unburden herself of a lengthy monologue about my abysmal taste in personal attire, or about how she saw the most wonderful material for new curtains during her latest foray into town. Now I can get some peace, at least. I'm up to 'Dah-dah-dah, dum. Dah-dah-dah dum' now...it's a work in progress..."
Ludwig, who hopes to one day be regarded as one of history's greatest composers, found that he couldn't get the 'me time' necessary to compose after his girlfriend moved into his spacious apartment. "Not spacious enough, apparently. Suddenly I needed new 'these' and my 'those' were too dowdy. Within weeks of her arrival my pad was packed wall-to-wall with brand new crap and all of my stuff was tossed to the curb, including my beloved lava lamp and super-comfy beanbag chair. But that wasn't enough to keep her quiet. I soon came to the realization that hearing was an affliction which I most certainly could live without. From then on, to minimize the effect of the walking distraction that is my beloved, I endeavored to ensure that I only replied to her interminable henpecking when she noisily trundled into my line of sight." he continued, "For a while she thought I was giving her the silent treatment, and wanted to talk us through it. 'By God,', I thought, 'this plan sure has backfired!'. But eventually she decided that I'd gone deaf and the relentless yattering ceased, for the most part." As for his future plans, Beethoven admits only this, "I plan to go blind next. To be honest, she's not all that easy on the eyes. And it's 'BEET-hoffin', not 'BAY-toe-vuhn'. If I had a Kreuzer for every damn time someone mispronounced my name, I'd have enough to finance a friggin' symphony." This page was last edited on 4 June 2012, at 08:56.